"This pie is a refreshing end to a meal. It is always a big hit when served at gatherings. Enjoy!" Mix pretzels and sugar together in a bowl; stir in margarine until evenly incorporated. Spoon mixture into a 9-inch pie plate; press into bottom and up sides of plate to form a firm, even crust. Bake crust in the preheated oven until edges are lightly browned, about 5 minutes. Cool on a wire rack. Mix sweetened condensed milk, limeade concentrate, tequila, orange liqueur, and green food coloring in a large bowl. Beat cream in a glass or metal bowl until soft peaks form. Lift your beater or whisk straight up: the whipped cream will form soft mounds rather than a sharp peak. Fold whipped cream into sweetened condensed milk mixture. Spoon filling into cooled crust. Cover pie with plastic wrap and freeze until firm, about 4 hours. 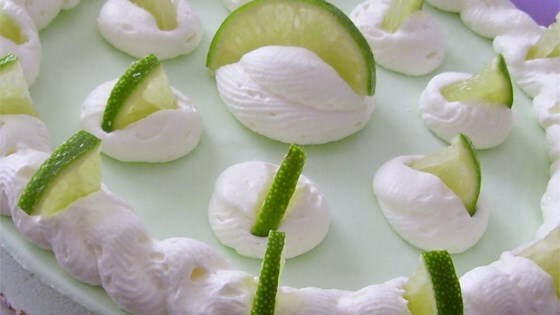 Let stand for 10 minutes before serving; garnish with lime slices. A melted mess 5 minutes out of freezer. Crust so hard you could not cut through it. This was good. Pretty easy to make and nice taste. Was a hit at a potluck and the first dessert to be gone. I used gluten free pretzels for the crust and did not add the food coloring. I made this exactly as written. Everyone loved it, I will make this again. It was all I could do not to eat the whole pie myself! I omitted the tequila and food coloring and used a ready made graham cracker crust. Fabulous. Spray pan before putting pretzel crust in it - tough to get out of the pan.